You will earn 5550.00 bonus points. ? 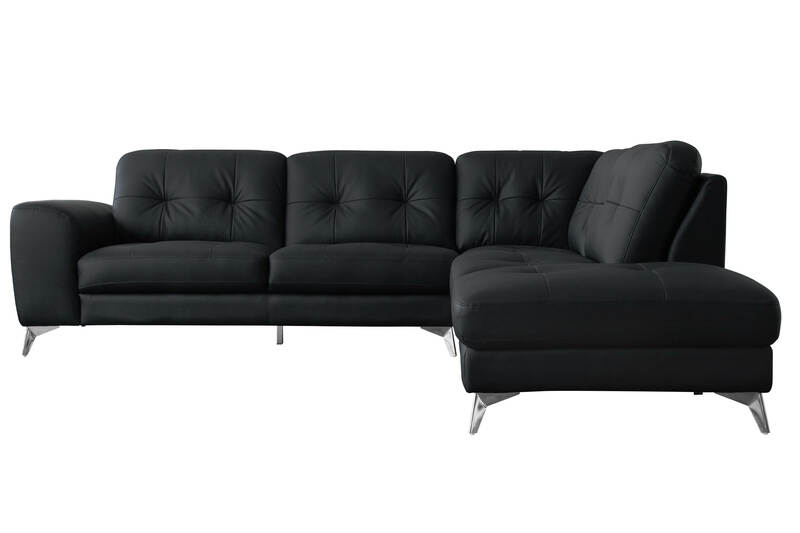 The Harlow is a comfy top-grain leather sectional, with a handy storage ottoman on the end. Top-grain leather with matching PVC sides and back. Top-grain leather Chrome Legs Contemporary Modern Style. Part of Harlow collection. Dimensions : 106. 5"W 36"D 33"H Product Weight : 190lbs. Seat Height : 17" Chaise Depth 89" Color : Black. Assembly is not required. Made in Malaysia. We are offering 1 year limited warranty (covered for any manufacturer's defect) Construction : PVC; Frame : Chrome Legs; Cover : Top Grain Leather; We understand how important your home is and how decorating your kitchen, dining room or bedrooms with classy, contemporary furnishings can help make it a place that reflects who you are. We believe in the power modern furniture has in creating not just a home but YOUR home. We believe in feeling good about our home's environment, and we think you do too. Wipe up spills immediately. If necessary, use a lightly dampened cloth and warm water; allow to air dry. Do not expose to direct sunlight or heat; keep leather dust free; test any leather cleaner on an inconspicuous spot before using.